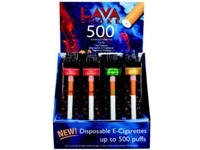 Since the Lava Smoke500 e-cigarette is electronic, that means that it does not burn like a traditional cigarette. It produces a vapor mist that is completely satisfying to the smoker in every way that a traditional cigarette is. What’s more, because of this technology, the Lava Smoke user can now enjoy smoking anywhere, anytime! Anywhere traditional smoking has been banned, typically LAVA SMOKE500 can go! Odorless and stops tobacco smell on clothes, hands and hair. Prevents tobacco smell on furniture, in car or in home. No need for matches, lighter or ash tray, just pick up and smoke. No more annoyance from well meaning non-smokers. For People Trying to quit – No more expensive pills, patches or gums that just don’t work.